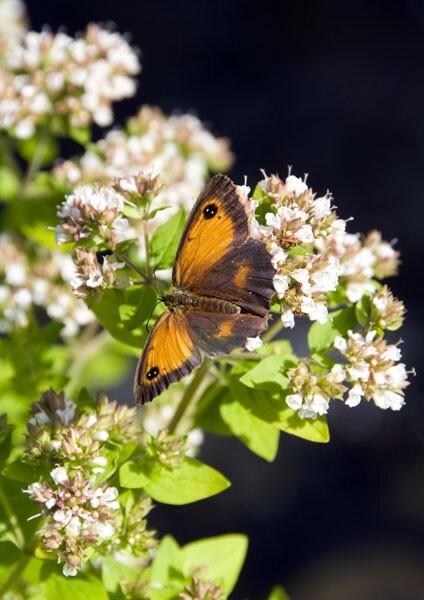 Canvas or poster print of a female Gatekeeper butterfly drawing nectar from the delicate flowers of a wild marjoram. Gatekeeper Butterflies prefer feeding on the edges of meadows and hedges. Gatekeeper butterfly drawing nectar from the delicate flowers of a wild marjoram. Gatekeeper Butterflies prefer feeding on the flowers at the edges of meadows and hedges. Gatekeeper Butterfly (Pyronia tithonus).